ORIGINAL DESCRIPTION: Bot.Mus.Leafl.Harv.Univ., 1962, 20(3): 75-6. Amended: Emboden, Narcotic Plants (2 Edition revised and enlarged), 1979: 93-4. Amended: Reisfield, SIDA Contributions to Botany, 1993, 15(3): 349-366. VERNACULAR NAMES: Mazatec: Ska Pastora, Ska María Pastora; Náhuatl: pipiltzintzintli; Spanish: Hojas de la Pastora, Hojas de María Pastora, La Hembra; English: Leaves of the Shepherdess, Leaves of Mary Shepherdess, Sage of the Seers, Diviners' Sage. DISTRIBUTION: Endemic to the Mazatec zone of the Sierra Madre Oriental of the Mexican state of Oaxaca. ECOLOGY: On black soil in ravines close to primary or secondary cloud forest and tropical evergreen forest, 300-1800 m elevation; flowering sporadically from September to May. BOTANICAL DESCRIPTION: Perennial herb, 0.5-1.5 m tall, flowering stems 1-2(-3) m tall. Stems hollow, quadrangular, flanged angles, hirtellous, green, translucent and crisp. Leaves opposite, elliptic to ovate, apex acuminate to caudate, base attenuate, 10-25(-30) cm long, 5-10 cm wide, glabrous above, below glandular-punctate, irregularly serrate or crenate-serrate margins. Racemes erect, simple, 30-40 cm long, internodes 2-4 cm; cymules having 3-6(-12) flowers; rachis hirsute, glabrate. Bracts ovate, concave, sessile, basally rounded, apex acuminate-caudate, 1-2(-3) cm long, 0.6-1 cm wide, tardily deciduous, mainly violet. Pedicels hirsute, slender, straight, violet, 4-9 mm long. Calyx with subequal lips, 10-12 mm long, glabrate to glandular-puberulent, violet; upper lip 1.5 mm long with 3 major veins. Corolla 28-32 mm long, sigmoid, densely villous with translucent multicellular hairs 0.5-2 mm long, white, glabrous within, lips becoming tinged with blue in age; tube 19-22 mm long, 2 mm high, 1.5 mm wide at narrowest near throat; galea 8-9(-10) mm long; lower lip cupped, 5 mm long and 7 mm wide when flattened, middle lobe emarginate. Stamens glabrous, white, slightly arcuate, 15-16 mm long, rudders 10-11 mm long, entire, anthers 2 mm long; pollen white. Style 27-32 mm long, densely bearded below stigma, white. Gynobase horn 3 mm long, 1.2 mm wide, white, glabrous. Nutlets 1.8-2 mm long, 1(1.2) mm wide at maturity, dark brown, unknown in wild collections [From amendment by Reisfield 1993]. BOTANICAL OBSERVATIONS: The scientific name of the genus comes from Latin salvus = safe; the specific name "which means "of the seers", refers to the curious use to which the plant is put by the Mazatec Indians", to wit, as a shamanic inebriant or entheogen in divination, especially of the causes of illness (Epling & Játiva-M. 1962; Wasson 1962). Unfortunately, the original type description (collected by A. Hofmann & R.G. Wasson 8 September 1962 in San José Tenango, Oaxaca, México; Herb.Univ.Cal., Los Angeles; duplicate in Econ.Herb.Oakes Ames) was in error regarding corolla color ("cyanearum" or cyan-blue), which was amended to "pure white" by Emboden in a popular book (Emboden 1979); then more fully amended by Reisfield, who described reproductive parts in detail, including the nutlets, noting that the corolla "lips become tinged blue with age" (Reisfield 1993). This amendement as to corolla color was unfortunately not before three separate color paintings of the plant had been published, mistakenly showing it with cyan-blue corollas. The first was by Frances Runyan as Plate 50 in the first edition of Emboden's Narcotic Plants (Emboden 1972) (in the second edition Emboden amended the description and replaced the erroneous painting with a close-up color photograph of the decidedly white flowers as Plate 40) (Emboden 1979). There were also two separate color paintings by Harvard Botanical Museum artist Elmer W. Smith depicting the flowers as cyan-blue. The first was in Richard Evans Schultes' 1976 Hallucinogenic Plants, which even depicted an enlarged, all-blue flower (Schultes 1976); the error being repeated in the French (Schultes 1978) and (pirated) Spanish translations (Schultes 1982). Finally, in their 1980 poster Plant Hallucinogens, illustration No. 23 likewise depicted S. divinorum with blue corollas (Schultes & Smith 1980). Suprisingly, for such a rare plant, two additional color paintings have been published, correctly depicting the flowers as white: by F. Lucerne Coray on page 55 of Schultes' and Halbert Hofmann's coffee-table book Plants of the Gods (Schultes & Hofmann 1979) and by D.D. Dowden in S. Foster's Herbal Bounty (Foster 1984)! Besides this plethora of color paintings of an obscure plant, there have also been published two different botanical illustrations, by John Stanwell-Fletcher (Schultes 1967; Stafford 1977) and Irene Brady (Mayer 1977; Schultes 1972; Schultes & Hofmann 1973), plus many black-and-white photographs of the plant (Díaz 1975; Valdés et al. 1983, 1987a; Wasson 1963, 1966), and a sketch (Heffern 1974), and the above-cited color photograph. AGRONOMIC DATA: There exists agronomic controversy over the status of S. divinorum as a cultigen. The type specimen was a cultivar, and the botanical discoverer of the plant said it "seems to be a cultigen", noting: "We were on the watch for S. divinorum as we criss-crossed the Sierra Mazateca on horseback in September and October of 1962, but never once did we see it. The Indians choose some remote ravine for the planting of it .. whether it occurs in a wild state (except for plants that have been abandoned or have escaped) we do not know" (Wasson 1962). Valdés, who made ethnographic and phytochemical study of this plant his thesis project, has challenged this, stating that his informant Don Alejandro "indicated that the plant grows wild in the fairly inaccessible highlands of the Sierra Mazateca" admitting, however, that all plants he saw were "apparently originally started by humans" (Valdés 1994). Valdés failed to cite Reisfield's thorough botanical and horticultural study of the plant, which concluded that the plant was a cultivar: "Hybridity is suggested, although intermediacy between two known species has not been recognized" (Reisfield 1993), while Epling & Játiva-M. (1962) noted an affinity with Salvia cyanea Lamb. ex Benth. Although Valdés had been able to obtain 4 seeds from 14 cross-pollinated flowers (28%), these were killed by overheating in a greenhouse, before viability could be assessed (Valdés et al. 1987a). Valdés also noted that D.J. Siebert had obtained viable seed from cultivated plants in Hawai'i (Valdés 1994), but the seedlings were very weak and of dubious viability in wild conditions (Siebert 1993-94). Reisfield found more than 50% of the pollen grains examined from S. divinorum to be unviable. He obtained only 11 nutlets from 108 self-pollinations, each potentially yelding 4 fruits, or a success rate of 11/432 (2.5%); while in 190 cross-pollinations, only 24 fruits developed (24/760 or 3%), commenting "at no time was a legitimate pollinator observed visiting flowers", even in a nocturnal "stakeout", althought mature seeds thus obtained produced some "vigorous seedlings [which] developed into plants indistinguishable .. from their parents". In his botanical description of the plant, Reisfield noted its habit of "trailing along rocky stream banks, sometimes in running water, rooting copiously at the nodes" (Reisfield 1993). CULTIVATION: Propagation is vegetative, and the plant requires rich soil and much moisture, tolerating sun if moisture is high. Cultivation is possible in northern latitudes, as, for example Valdés' work in Michigan, transplanting from outdoor gardens into greenhouses in the winter, with 10°C minimum temperature maintained (Valdés et al. 1987a). This plant has come to be widely cultivated by North American "basement shamans", and has been commercially available in the United States since the early 1980s (Foster 1984) and circulated non-commercially in the previous decade (Grubber 1973; Superweed 1972). The so-called "Wasson clone" (from the Hofmann and Wasson 1962 type collection) is the most commonly sold, along with at least one so-called "palatable clone", which is far less bitter than the type clone, and was collected by Bret Blosser in Llano de Arnica, Oaxaca (Blosser 1991-93; Ott 1995b). ETHNOBOTANICAL DATA: S. divinorum is employed as a shamanic inebriant by the Mazatec Indians of the Mexican state of Oaxaca, first described in the ethnographic literature in 1939 by J.B. Johnson, who noted the use of Hierba María in Mazatec "witchcraft", parallel to the use of divinatory mushrooms and morning glory seeds (Johnson 1939). Subsequently described as Yerba de María by Roberto J. Weitlaner (1952), it was the great pioneer in shamanic studies R. Gordon Wasson who first collected identifiable material of this novel species, and became the first outsider to sample its visionary powers, in Ayautla, Oaxaca, on 12 July 1961. Wasson described customary ingestion of pairs of the leaves, known as Ska Pastora or La Hembra, by chewing and shallowing, and also described preparation of a visionary potion by making an aqueous infusion/suspension of the leaves via hand squeezing, much as Weitlaner had described "rubbing" the leaves in water (Wasson 1962; Weitlaner 1952). Wasson also photographed use of a metate to express and infuse the leaves (Hofmann 1990; Wasson 1963, 1966), giving a dose as 6-68 leaves; whereas Weitlaner had said 50-100. Ott reviewed reports of pharmacology of the leaves, with a dose being described in a dozen sources as varying from a low of 6 to a high of 240 leaves (Ott 1995b). Building on the pioneering ethnographic work of Wasson, the group of J.L. Díaz and L.J. Valdés have conducted the most detailed ethnobotanical studies of this plant (Díaz 1975, 1977, 1979; Valdés 1983; Valdés et al. 1983, 1987a). Although shamanic use of S. divinorum has not been observed outside of the Sierra Mazateca, Wasson proposed that the plant represented a mysterious Mexica or Aztec entheogen, known in Náhuatl as pipiltzintzintli, the "most noble little prince" (Wasson 1963). It was further suggested by Emboden that the plant was depicted on the headdress of a deity found in the Mayan Dresden Codex (Emboden 1983). Although Valdés, following Aguirre Beltrán and Díaz, alleged that S. divinorum couldn't have been pipiltzintzintli (Aguirre Beltrán 1963; Díaz 1979; Valdés et al. 1987a), alternate candidates proposed are impossible - the first, Cannabis sativa L., is a post-conquest introduction to México (Schultes & Hofmann 1980); while the second, ololiuhqui (seeds of coaxihuitl or Turbina corymbosa (L.)Raf.) was identified by one primary source of information on pipiltzintzintli, Friar Agustín de Vetancurt, in his 1698 Teatro Mexicano, as a plant sometimes mixed with pipiltzintzintli (Vetancurt 1698). My recent review of the pertinent evidence concluded that S. divinorum "remains our best guess for the identity of the lost Aztec entheogen" (Ott 1995b). I also cited the rather crude and demonstrably inefficient Mazatec method of preparing the entheogen and its lack of a true indigenous name in Mazatec (noting its association with sheep, a post-conquest introduction supporting its identity with pipiltzintzintli, since other Mesoamerican Indians were the likeliest source of this introduction (Ott 1995b). Nevertheless, until the plant is found elsewhere or in truly wild conditions, or until the hypothetical parents of this presumed hybrid are identified, it will remain an ethnobotanical enigma. Wasson noted that S. divinorum was la hembra, "the female" in a family including el macho "the male", Coleus pumila Blanco and el nene or el ahijado, "the child" or "the godson", Coleus blumei Benth. - since both are Asiatic species introduced post-conquest to Mesoamerica, this datum strenghtens the argument for non-native status of S. divinorum in the Sierra Mazateca (Wasson 1963). BIOCHEMICAL DATA: Like many other members of the genus, S. divinorum contains unusual terpenoid compounds. Following up the finding of salviarin and splendidin, novel trans-clerodane diterpenes, in the Brasilian species Salvia splendens Sellow ex Roem. et Schult. (Savona et al. 1978, 1979), the Mexican group of Alfredo Ortega, using no bioassay, isolated a novel trans-neoclerodane diterpene from S. divinorum, naming the compound salvinorin, and determined its structure by X-ray crystallography (Ortega et al. 1982). Two years later, the American group of Valdés isolated the same compound, as presumed visionary principle of S. divinorum leaves, along with its inactive desacetyl derivative, giving these compounds the name divinorin A and divinorin B (Valdés et al. 1984). Again, structure elucidation was carried out by X-ray crystallography, confirming the structure established by the Ortega group, and in a note added in proof to their 1984 article, the Valdés group conceded priority, noting the correct names for the compounds were salvinorin A and salvinorin B. Valdés subsequently reported his isolation from S. divinorum of the ant-repellant loliolide, originally from Lolium perenne L. and of unknown human pharmacology (Valdés 1986). Finally, the absolute stereochemistry of salvinorins A and B was established by collaborators of Valdés (Koreeda et al. 1990). Unlike the well-known culinary sage, Salvia officinalis L., some strains of which contain the volatile psychotropic terpenoid thujone (Tucker et al. 1980), steam distillation of fresh leaves of S. divinorum failed to detect thujone (Ott 1993). The volatile nature of this compound, famous psychoactive agent in Artemisia absinthium L. and absinthe liqueurs, makes culinary sage potentially psychoactive by simply smelling the fresh herb (Duke 1987). TRADITIONAL MEDICINE USES: Besides its primary use in shamanic divination by the Mazatecs of México, S. divinorum infusions are also applied topically by the Mazatecs. Weitlaner described bathing the patient in the same infusion of the leaves that was previously ingested (Weitlaner 1952), and the Valdés group described putting the extracted leaf residue on the patient's head as a cataplasm (Valdés et al. 1983). The Valdés group also documented curative use of an infusion of 4-5 pairs of fresh or dry leaves to cure or regulate digestive problems like diarrhea, as a stimulant or tonic for the elderly, against headache and rheumatism, and to cure a magical illness called panzón de barrego [sic] "big lamb's belly" (Valdés et al. 1983). Significantly, Friar de Vetancurt mentioned that leaves of pipiltzintzintli were used both in the preparation of a divinatory potion and were applied topically as a poultice, a strong argument in favor of the identification of pipiltzintzintli as S. divinorum (Vetancurt 1698). PHARMACOLOGICAL DATA: Further to laboratory studies the Valdés group hypothized that the psychoactive principle present in the S. divinorum leaves is salvinorin A (Valdés 1994, Valdés et al. 1984, 1987b). Nevertheless, it is evident that this bioessay was too inspecific, and it is inexplicable why the Valdés group, despite rather extensive psychonautic bioassays with the leaves themselves, failed to employ a human psychonautic bioassay to guide their phytochemical work, or at least to conduct psychoanutic bioessays of salvinorin A to verify that it represented the visionary principle of the leaves. Definitive proof that salvinorin A represented the entheogenic active principle had to wait another decade, when a group of "basement shamans" in California were able to isolate a salvinorin A-enriched crude precipitate (which I shortly thereafter established was about 50% salvinorin A), demonstrating by vaporizing and inhaling the compound that it was indeed the visionary principle of the leaves of Mary Sheperdess, seemingly active at about the 1 mg level! Subsequent tests showed that the threshold for activity of the vaporized, inhaled compound was 200 mcg, making this an order of magnitude more potent than psilocine, hitherto the most potent natural product entheogen (Fischer 1963). Doses as high as 2.6 mg were administered by this route, with bizarre and overwhelming out-of-body experiences common above the 1 mg level (Siebert 1994). These "basement shamans" had already established that the whole leaf was far more active via the "quid method", that is, chewed and held in the mouth like coca with no swallowing, than chewed and swallowed as the Mazatecs do - 10 leaves chewed by the quid method were distinctly active in all volunteers, whereas the same dose blended in water and swallowed was inactive in all subjects (Siebert 1994). Young hipsters in México City, who returned from sojourns fro mushroomic tourism in the Sierra Mazateca to México City with dried leaves of S. divinorum, were observed to smoke these as a sort of marijuana substitute, and I established in 1975 that the smoked leaves were indeed active (Díaz 1976; Ott 1993). The dried leaves may also be rehydrated and chewed by the quid method (Pendell 1995). Although Siebert found orally-ingested capsules of crystalline salvinorin A inactive at doses up to 10 mg, and 2 mg doses of buccal spray of a dilute ethanolic solution of salvinorin A to be weakly active (Siebert 1994), I found sublingual application of salvinorin A in acetone and dmso (Ott 1995c) to be highly active, with a threshold for physical effects of 100 mcg, definite psychoactivity at 250-500 mcg and visionary activity above 1 mg. My review of some 2 dozen reports of human pharmacology of S. divinorum and salvinorin A estimated the following descending order of potency for the different routes of ingestion: sublingual salvinorin A = vaporized salvinorin A = chewed leaf, quid method = chewed leaf, swallowed = infusions of leaf (Ott 1995b). It was difficult to place the smoked leaves in this scheme, as for many people (about half, in a pair of informal tests involving some 20 volunteers at a time) they are inactive, and for some elicit only a mild effect after several inhalations, which subsequent smoking fails to augment. The pharmacological data I reviewed involved aqueous infusions of 6-160 leaves; chewed and swallowed doses of 26 leaves; ingestion by quid method of 6-26 leaves; smoking of 1-2 leaves; vaporized and inhaled salvinorin A doses of 200 mcg - 2.6 mg; and sublingual doses of 100 mcg-1.0 mg salvinorin A (Ott 1995b). Owing to its unique chemistry (being non-nitrogenous, unlike the great bulk of known visionary compounds, which are alkaloidal), it is to be expected that salvinorin A pharmacology involves novel neurochemistry, perhaps even interaction with a yet-unknown receptor in brain. Indeed, salvinorin A was tested on 42 known bioreceptors in a procedure called NovaScreen® and there was no significant competitive inhibition of reference target compounds on any receptor. There were 15 neuroreceptors tested: adenosine, alpha 1 and 2, beta, dopamine 1 and 2, GABAa, GABAb, serotonine 1 and 2, muscarinic 3, NMDA, kainic acid, quisqualic acid and glycine; plus MAOa and MAOb (Siebert 1994). EFFECTS: Wasson compared the effect of the leaf infusion to psilocybian mushrooms, noting that it "..was less sweeping, and lasted a shorter time [..] .. it did not go beyond the initial effect of the mushrooms - dancing colors in elaborate three-dimensional designs" (Wasson 1962). Valdés emphasized the need for silence and darkness for full effects to manifest, and noted the perceived "reality" of vivid and "amazing" "hallucinations" described as being "quite complete, being visual, oral, aural, and tactile" (Valdés 1994). Following inhalation of vaporized salvinorin A, Siebert stated: "people report having visions of people, objects, and places. With doses above 1 mg, out of body experiences are frequent" (Siebert 1994). Most people exposed to higher doses of the vaporized compound report immersion in bizarre, non-Euclidian dimensions or geometries, often described as curved, tubular or spherical; not a few find the experience to be terrifying; many note that the experience is unique, not comparable to other entheogens. Duration of effects is a function of route of ingestion, with the swallowing of the leaves or leaf infusions producing effects lasting from one to a few hours after a latency period of 15-45 minutes (Valdés et al. 1983). The quid method produces effects commencing in about 10 minutes and lasting 1-2 hours. Vaporized and inhaled salvinorin A exerts an effect in 10-15 seconds, building rapidly to a peak lasting only about 5-10 minutes, then subsiding over 20-30 minutes (Siebert 1994). Sublingual salvinorin A in solution begins to be felt in about 90 seconds, reaching a maximum effect at 10-15 minutes, and lasting 1-2 hours. Smoking dried leaves typically exerts a mild effect at 10-15 minutes, and lasting 1-2 hours. Smoking dried leaves typically exerts a mild effect, felt after 5-6 inhalations and lasting 1-2 hours. Effects are in all cases virtually identical (Ott 1995b). Aguirre Beltran G., 1963, Medicina y Magia: El Proceso de Aculturación en la Estructura Colonial, México, INI. ANON., 1993a, "Salvia divinorum", The Entheogen Review, 2(1):14. ANON., 1993b, "Salvia divinorum", The Entheogen Review, 2(3):12. ANON., 1994a, "Salvia ayahuasca", "Smoking Salvia", "Salvia propagation", The Entheogen Review, 3(3):16-17. ANON., 1994b, Mazatec magic, Psyched.Ill., 6:28. BLOSSER B., 1991-93, Pers. comm., Jatun Sacha, Ecuador; Catemaco, Veracruz; Maui, Hawai'i and corrispondence. Also, short paper in press in Integration. CARDENAS J. de, 1591, De los Problemas y Secretos Maravillosos de las Indias, México D.F. DEKORNE J., 1993, A word in the wise. The Entheogen Review, 2(4):15. DEKORNE J., 1994, Psychedelic Shamanism. The Cultivation, Preparation and Shamanic [sic] Use of Psychotropic Plants, Port Townsend, WA, Loompanics. DIAZ J.L., 1975, Etnofarmacología de algunos psicotrópicos vegetales de México, Cuad.Cientif. CEMEF, 4:135-201. DIAZ J.L., 1977, Ethnopharmacology of sacred psychoactive plants used by the Indians of Mexico, Ann.Rev.Pharm.Toxicol., 17:647-675. DIAZ J.L., 1979, Ethnopharmacology and taxonomy of Mexican psychodysleptic plants, J.Psyched.Drugs, 11(1-2):71-101. DUKE J.A., 1985, Handbook of Medicinal Herbs, CRC, Boca Ratón, FL. DUKE J.A., 1987, Living Liqueurs, Vol. IV, Bioactive Plants, Quaterman, Lincoln, MA. EMBODEN W., 1972, Narcotic Plants, The Macmillan, New York, NY. EMBODEN W., 1979, Narcotic Plants, Revised and enlarged second edition, The Macmillan, New York, NY. EMBODEN W., 1983, The ethnobotany of the Dresden Codex with special reference to the narcotic Nymphaea ampla, Bot.Mus.Leafl., Harv.Univ., 29(2):87-132. EPLING C. & D.C. JATIVA-M., 1962, A new species of Salvia from Mexico, Bot.Mus.Leafl., Harv.Univ., 20(3):75-76. ESTRADA A., 1977, Vida de María Sabina, la Sabia de los Hongos, Siglo Veintiuno, México D.F., México. Translated into English by H. Munn, 1981, María Sabina: Her Life and Chants, Ross-Erikson, Santa Barbara, CA. EVANS W.C., 1989, Trease and Evans' Pharmacognosy, Ballière Tindall, London. FISCHER G.M., 1963, Some comments concerning dosage levels of psychedelic compounds for psychotherapeutic experiences, Psyched.Rev., 1(2):208-218. FORTE R., 1994, Internet B.B.S. 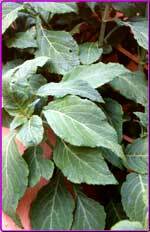 posting dated 29 September to entheogen@hyperreal.com regarding effects of Salvia divinorum. FOSTER S., 1984, Herbal Bounty! The Gentle Art of Herb Culture, Gibbs M. Smith, Salt Lake City, UT. Revised edition, 1993, Herbal Renaissance-Growing, Using & Understanding Herbs in the Modern World. GARZA M. de la, 1990, Sueño y Alucinación en el Mundo Náhuatl y Maya, UNAM, México D.F. GRINSPOON L. & J.B. BAKALAR, Psychedelic Drugs Reconsidered, Basic Books, New York, NY. GRUBBER H., 1973, Growing the Hallucinogens, High Times / Level Press, San Francisco, CA. HEFFERN R., 1974, Secrets of the Mind Altering Plants of Mexico, Pyramids Books, New York, NY. HOFMANN A., 1964, Mexikanische Zauberdrogen und ihre Wirkstoffe, Planta Medica, 12(3):341-352. HOFMANN A., 1979, LSD: Mein Sorgerkind, Klett-Cotta, Stuggart, Germany. Translated into English by J. Ott, 1980, LSD: My Problem Child, McGraw-Hill, New York, NY. Translation reprinted in 1983, J.P. Tarcher, Los Angeles, CA. HOFMANN A., 1990, Ride through the Sierra Mazateca in search of the magic plant "Ska María Pastora", in: T.J. Riedlinger (Ed. ), op.cit., :115-127. JOHNSON J.B., 1939, The elements of Mazatec witchcraft, Göteborg Etnografiska Museum Ethnologiska Studier, 9:119-149. KOREEDA M. et al., 1990, The absolute stereochemistry of salvinorins, Chem.Lett., :2015-2018. LA BARRE W., 1970, The Ghost Dance: The Origins of Religion, Dell, New York, NY. MCKENNA D.J., 1995, Bitter brews and other abominations. The uses and abuses of some little-known hallucinogenic plants, Integration, 5:99-104. MAYER K.H., 1977, Salvia divinorum. Eine Halluzinogen von Oaxaca, Mexiko, Ethnol.Amer., 14(2):776-779. METZNER R., 1971, Mushrooms and the mind, in: B. Aaronson & H. Osmond (Eds. ), Psychedelics: The Use and Implications of Hallucinogenic Drugs, The Hogarth Press, London, :90-107. ORTEGA A. et al., 1982, Salvinorin, a new trans-neoclorodane diterpene from Salvia divinorum (Labiatae), J.Chem.Soc. Perkins Trans. I, :2505-2508. OTT J., 1993, Pharmacotheon, Natural Products, Kennewick, WA. OTT J., 1994, Ayahuasca Analogues: Pangoean Entheogens, Natural Products, Kennewick, WA. OTT J., 1995a, The Age of Entheogens and the Angel's Dictionary, Natural Products, Kennewick, WA. OTT J., 1995b, Ethnopharmacognosy and human pharmacology of Salvia divinorum and salvinorin A, Curare, 18(1):103-129. OTT J., 1995c, Hitherto unpublished laboratory research. Salvinorin A isolated from the "Wasson clone" and purified by recrystallization from ethanol/acetone, mp. 240°C. Identity and purity verified by mass-spectral analysis and thin-layer chromatographic comparison with authentic reference sample supplied by L.J. Valdés III, using iodine vapors and phosphomolybdic acid for detection. Oral ingestion experiments conducted with a 1% solution (10mg/1.0ml) salvinorin A in acetone, dosing sublingually with volumetric micropipettes. A 1% solution of salvinorin A in DMSO is also useful for sublingual application. OTT J., 1995d, "Technical notes", in: Bibra E. von, Plant Intoxicants (Translation by H. Schleiffer of: Die Narkotischen Genussmittel und der Mensch, Verlag von Wilhelm Schimd, Nürnberg, Germany, 1955), Healing Arts, Rochester, VT, :223-261. PENDELL D., 1995, Pharmako/Poeia, Mercury, San Francisco, CA. RATSCH C., 1988, Lexikon der Zauberpflanzen, Akademiske Druck und Verlagsanstatt, Graz, Germany. Translated into English by J.Baker, 1992, The Dictionary of Sacred and Magical Plants, Prism, Bridport, England. REISFIELD A.S., The botany of Salvia divinorum (Labiatae), SIDA Contrib.Bot., 15(3):349-366. REKO B.P., 1945, Mitobotanica Zapoteca, Privately printed, Tacubaya, México. RICHARDSON P.M., 1986, Flowering Plants: Magic in Bloom, The Encyclopedia of Psychoactive Drugs, S.H. Snyder & M.H. Lader (Eds. ), Chelsea, London. RIEDLINGER T.J. (Ed. ), 1990, The Sacred Mushroom Seeker: Essays for R. Gordon Wasson, Dioscorides, Portland, OR. ROQUET S., 1972, Unpublished observations cited in Valdés et al., 1983. ROQUET S. & P. FAVREAU, 1981, Los Alucinógenos: De la Concepción Indígena a una Nueva Psicoterapia, Prisma, México D.F. SAVONA G. et al., 1978, Salviarin, a new diterpenoid from Salvia splendens, J.Chem.Soc.Perkins Trans. I, :643-646. SAVONA G. et al., 1979, Splendidin, a new trans-clerodane from Salvia splendens, J.Chem.Soc.Perkins Trans. I, :533-534. SHULDES B.M., 1994, Internet B.B.S. posting 18 October to entheogen@csp.org regarding effects of Salvia divinorum. SCHULTES R.E., 1867, The place of ethnobotany in the ethnopharmacologic search for psychotomimetic drugs, in: D.H. Efron et al., (Eds. ), Ethnopharmacologic Search for Psychoactive Drugs, Public Health Service Publ. No. 1645, U.S. Government, Washington, D.C., :33-57. SCHULTES R.E., 1969, Hallucinogens of plant origin, Science, 163:245-254. SCHULTES R.E., 1970, The botanical and chemical distribution of hallucinogens, Ann.Rev.Plant Physiol., 21:571-598. SCHULTES R.E., 1972, An overview of hallucinogens in the Western Hemisphere, in: P.T. Furst (Ed. ), Flesh of the Gods: The Ritual Use of Hallucinogens, Praeger, New York, NY, :3-54. SCHULTES R.E., 1976, Hallucinogenic Plants, Western Publ., New York, NY. SCHULTES R.E. (translation by J. Lepage), 1978, Atlas des Plantes Hallucinogènes du Monde, Ed. de l'Aurore, Montréal. SCHULTES R.E. (Pirated translation by S.C. Estrada), 1982, Plantas Alucinógenas, La Prensa Médica Mexicana, México D.F. SCHULTES R.E., 1994, El campo virgen en la investigación de las plantas psicoactivas, in: J.M. Fericgla (Ed. ), Plantas, Chamanismo y Estados de Consciencia, Los Libros de la Liebre de Marzo, Barcelona, :25-116. SCHULTES R.E. & N.R. FARNSWORTH, 1980, Ethnomedical, botanical and phytochemical aspects of natural hallucinogens, Bot.Mus.Leafl.Harv.Univ., 28(2):123-214. SCHULTES R.E. & A. HOFMANN, 1973, The Botany and Chemistry of Hallucinogens, Charles C. Thjomas, Springfield, IL. SCHULTES R.E. & A. HOFMANN, 1979, Plants of the Gods, McGraw-Hill, New York, NY. Reprinted in 1992, Healing Arts, Rochester, VT.
SCHULTES R.E. & E.W. sMITH, 1980, Plant Hallucinogens: Sacred Elements of Native Element, United Communications, Woodmere, NY (Color poster). SIEBERT D.J., 1993-94, Personal comm., Los Angeles, CA and correspondence. SIEBERT D.J., 1994, Salvia divinorum and salvinorin A: New pharmacologic findings, J.Ethnopharm., 43(1):53-56. STAFFORD P., 1977, Psychedelic Encyclopedia, And/Or Press, Berkeley, CA. SUPERWEED M.J., 1972, Home Grown Highs: How to Grow Peyote, Psilocybe and Other Organics, Stone Kingdom Syndicate, San Francisco, CA. TUCKER A.O. et al., 1980, Botanical aspects of commercial sage, Econ.Bot., 34(1):16-19. VALDES III L.J., 1983, The Pharmacognosy of Salvia divinorum Epling & Játiva-M., Thesis, Univ. Michigan, Michigan, Ann Arbor, ML. VALDES III L.J., 1986, Loliolide from Salvia divinorum, J.Nat.Prod., 49(1):171. VALDES III J.L., 1994a, Feedback on salvinorin A and Datura, The Entheogen Review, 3(3):16. VALDES III J.L., 1994b, Salvia divinorum and the unique diterpene hallucinogen, salvinorin (divinorin) A, J.Psychoact.Drugs, 26(3):277-283. VALDES III J.L. et al., 1983, Ethnopharmacology of Ska María Pastora (Salvia divinorum Epling & Játiva-M.), J.Ethnopharm., 7(3):287-312. VALDES III J.L. et al., 1984, Divinorin A, a psychotropic terpenoid, and divinorin B from the hallucinogenic Mexican mint Salvia divinorum, J.Org.Chem., 49(24):4716-4720. VALDES III J.L. et al., 1987a, Studies of Salvia divinorum (Lamiaceae), an hallucinogenic mint from the Sierra Mazateca in Oaxaca, Central Mexico, Econ.Bot., 41(2):283-291. VALDES III J.L. et al., 1987b, Coleus barbatus (C.forskohlii) (Lamiaceae), and the potential new drug forskolin (coleonol), Econ.Bot., 41(4):474-483. VETANCURT A. de, 1698 (1971), Teatro Méxicano. Descripción Breve de los Sucesos Ejemplares Históricos y Religiosos del Nuevo Mundo de las Indias, Porrúa, México D.F. WASSON R.G., 1962, A new Mexican psychotropic drug from the mint family, Bot.Mus.Leafl.Harv.Univ., 20(3):77-84. WASSON R.G., 1963, Notes on the present status of ololiuhqui and the other hallucinogens of Mexico, Bot.Mus.Leafl.Harv.Univ., 20(6):161-193. WASSON R.G., 1966, Ololiuhqui and the other hallucinogens of Mexico, in: W. Jiménez Moreno et al. (Eds. ), Summa Antropológica en Homenaje a Roberto J. Weitlaner, INAH, México D.F., :329-348. WASSON R.G. et al., 1974, María Sabina and her Mazatec Mushroom Velada, Harcourt Brace Jovanovich, New York, NY. WEITLANER R.J., 1952, Curaciones mazatecas, An.Inst.Nac.Antrop.Hist., 4(32):279-285.